I think I have become addicted to the euphoria of a recipe turning out fine on its first try. Not that I profess to be great in the kitchen or anything like that though. For a family with some picky eaters, the indication I use for a dish turning out fine is when it gets finished up with no fuss. 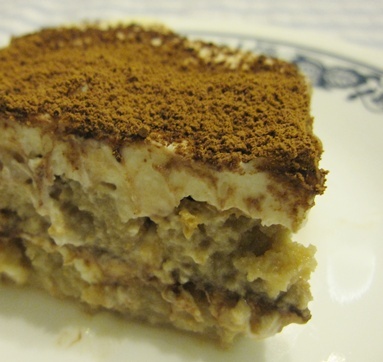 Hubby has been requesting for Tiramisu and finally I found a popular recipe that seems do-able for a novice like me. I did not follow the recipe to the dot. Blur me only realised that I had forgotten to buy fresh milk when I was about to begin. I decided to risk it with instant milk reconstituted from the powdered milk we take instead. The taste was still fine, although I would make sure fresh milk was available the next time I make this again. Since liquor is not something we enjoy, I decided to forgo that and use black coffee as its substitute instead. In my household, the domestic helper usually does the daily mundane cooking. So, the satisfaction of knowing that you possess the ability to contribute something different and tasty to the table keeps me going. As the saying goes : The way to a man’s heart is through his stomach, Hubby’s smile as he spooned the last bit into his mouth says more than what he verbalises. 1. Roast the lady fingers in the oven at 160°C for about 5 minutes. 2. Beat very well the whip cream and 100g sugar until sugar is dissolved. Do not overbeat as whip cream can turn to curds. 3. Beat very well the cheese and 100g sugar until sugar is dissolved. 4. Combine beaten whip cream and cheese with vanilla essence and the liquor. Place in the refrigerator. 5. Place all the ingredients into a measuring cup and warm it for 30 seconds in the microwave. 6. Place a layer of lady fingers on the bottom of the baking pan. 7. Using exactly half the liquid, sprinkle evenly all over the lady fingers. 8. With a tea strainer and teaspoon, powder with cocoa all over the lady fingers. 9. Take 1/3 of the cream and place it in the middle of the cake. Push the cream towards the sides of the pan until it touches the walls. The cream must touch the walls all around, and make sure the cream is well-spread with no holes communicating with the lady fingers below. 10. 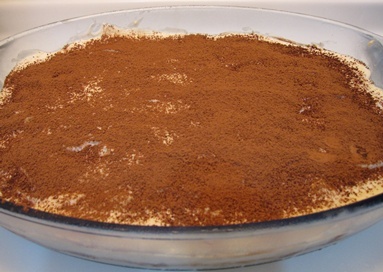 Place next layer of lady fingers over the cream. Sprinkle the rest of the syrup, followed by the cocoa powder. Place the rest of the cream on top of everything. 11. Level well and sprinkle with plenty of cocoa powder.